You’ll likely finish the campaign before you hit level 20. Start playing at the hardest difficulty when you do your missions and strikes for more XP. If you can, try to do these missions with a friend or two as well, because that really helps and is good practice for the harder content where teammates will be necessary. This vendor will be very useful to you early on as well as in the future. He’ll provide you with a way to decrypt all of your Engrams. When you use him to decrypt Engrams, you’ll undoubtedly get armor that you do not want. When you dismantle items, each class receives a different material. For example, when a Hunter dismantles armor, they’ll receive Sapphire Wire. If you find that you have an abundance of a particular dismantle material, put your engrams in your Vault and decrypt them on another class! Level 20 Legendary & Exotic items require various materials to upgrade, such as Spinmetal. Always collect materials and open chests if you see them out in the wild. We have many farming guides to help you with this. 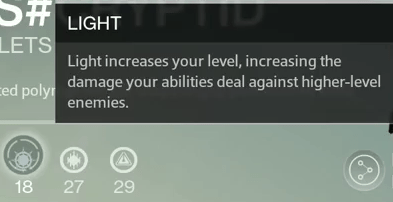 When you upgrade your Defense rating on your Legendary/Exotic armor, your Light level will actually increase. These give you massive experience boosts and reputation, and generally they’re easy to knock out when you’re doing what you’d normally be doing anyway. Of course this is great at any level, but before you’re level 20, playing in the Crucible will also earn you easy experience. Along with experience, you’ll start earning Crucible Marks and Rep too – which can be used to buy gear from the Crucible vendors once you’re level 20. You can only earn a maximum of 100 marks per week, so be sure you are capping every week. The total cap is 200. You earn 3x marks for winning a match and 2x marks for losing. Check out this ultimate PvP guide for some helpful tips on how to improve your experience. These are quick, simple, and easy ways to earn Reputation. There’s usually at least 1 Patrol related bounty as well, which will net you 2,500+ experience. Before you choose a Crucible Faction to represent, doing these will earn you Vanguard Marks for the Vanguard Class vendors & Quartermaster. In addition to what’s mentioned above, once you’re level 20 you need focus on gathering materials for your upgrades. Click here for a guide to gathering all these materials. It’s always a good idea to participate in public events, but especially once you’ve hit level 20. The first one you complete each day will reward you with materials like Ascendant Shards or Energy – both are crucial for upgrading your Legendary and Exotic gear. You can see what events are happening in real time on the sidebar of our homepage. Do these at the highest difficulty you can, as it’ll give you more Ascendant materials and experience, and will serve as early practice for the harder content. This Strike will earn you a minimum of 3 Strange Coins once per week, which are essential for buying Exotics (see: Level 24). If you do the highest difficulty, you get 6 more coins from the two other difficulties in addition to the initial 3. Do this on each character (store Coins in your Vault), and you can get up to 27 coins in total each week. These coins can be used to buy Exotics from the Agent of the Nine. For more about the mission and strike difficulties and skulls, check out this guide. Vanguard Strikes allow you to play a random Strike at Level 18, 20, 22, etc. and reward you with Vanguard Marks and Rep.
As soon as your Light level is high enough, attempt the higher level Vanguard Strikes so that you can get more Rep and Marks. The gear you earn from these Strikes will help you progress to level 24. Extra rep can be gained through patrols and material exchanges. This guide will help you maximize your reputation gains. Your at the bleeding edge of progression now. Now that you’ve got at least all Rare gear, it’s time to earn and start upgrading Legendary items. It’s best to save your upgrade materials for your Legendary items, even though it’s tempting to use them earlier. Gaining reputation with your Faction vendor, Vanguard Quartermaster, or Crucible Handler, is one of the best ways to acquire Legendary equipment. You want to be at least rank 2 so you can get the armor those vendors sell. Completing basically any event or mission will add to your reputation! Check out this guide for gaining quick reputation. This Agent of the Nine appears each Friday somewhere in the Tower. The Exotic armor he sells will cost 13 Strange Coins, and 1 weapon for 23 Strange Coins. You can find more about Xûr here. Occasionally the Queen’s Emissary will make a visit to the Tower, and will reward you with easy Legendary items for completing her Kill Order missions. This is a quick and easy way to replace some of your Rare gear. Consider holding off on joining a Faction until you’re at least rank 2 with the Vanguard, since they might have something good you (or your alts) that isn’t in the Faction’s inventory. Once you’re 26, take special consideration for how you’re going to be using your upgrade materials. As mentioned above, keep in mind that you will replace gear quickly. You’ll likely find at least 1 item each week with a higher Light level, which will replace what you’re currently using. Technically you’ll be able to enter the Vault of Glass at level 25, but that would be unwise, unless you’ve got an experienced team that’s completed it before. 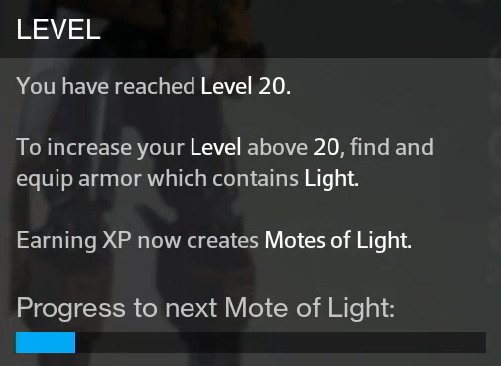 Once you upgrade VoG armor to the fullest, you can actually get your Light level to 30 (cap). It’s a good idea to hold off on upgrading your non-VoG Legendary items if you think you’ll have a chance at VoG armor/weapons. You can see some of the specific raid armor here. For the first time you do the weekly Nightfall event (successfully), you’ll be rewarded with bonus XP for the entire week and a bright blue flame. These are brutal, heavily modified missions which award Legendary, Exotic, and Ascendant materials upon completion. You can read more about this difficulty, along with Destiny’s skulls, in this article. By 26+ you’ll be near or at rank 3 in your preferred Faction(s). At Rank 3 for any Faction, you’re sent a Legendary item. Every rank after you’ll get another Legendary item. You can switch between which Faction you represent at any time, and there’s no penalty for switching; you will not lose reputation. Ultimately, having said all that, playing with your friends and doing what you enjoy in-game should be what you’re doing. Sure, you can grind for gear or materials… but if that’s not what you enjoy, then there’s really no sense in doing it. Don’t get too caught up in trying to finish the content ASAP. Make your own content, go on the unbeaten path and find your own ways to have fun. While you’re away from the controller, check out our friendly and inclusive community forums to meet other Guardians who you could play with in the future.